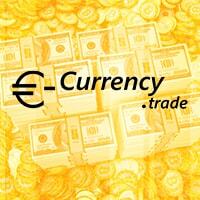 eCurrency Trade is one of the newest players in the exchange service market today. It debuted in November 2014, but it already exhibits quality that can match some of the well-known exchange brands despite its age. 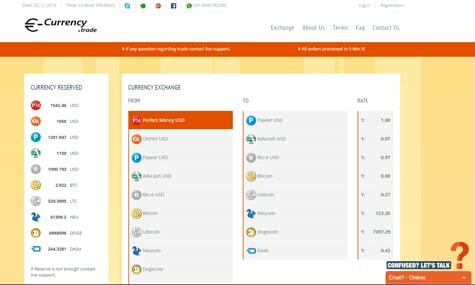 It provides exchange services between e-currencies and cryptocurrencies that feature brands like Bitcoin, Litecoin, Neucoin, OKPay, WebMoney, PayPal, and other recognizable names in the market. In addition, eCurrency Trade only deals with fiat currencies in US dollar. For new users, the process of registration is a breeze and not to mention quick. The fields that require to be filled in only involves the following—name, email, username, password, country, and mobile number. As soon as these are completed, users can employ the functions of the exchange platform. How does eCurrency Trade works? To start exchanging currencies, customers can simply place the desired amount to be converted. There is no need to deposit funds into your accounts. After placing an order you will have to send the currency you wish to have exchanged into another medium. This can be from fiat currency to virtual currency, or the other way around. Take note of the reserve table displayed on the left hand side of the page, which shows the availability of credit the exchange currently houses. Upon finalizing the latter conditions, details for payout will be asked from you after confirming the amount to be exchanged. This includes the provision of the wallet address where you want the funds to be directed, and sending the amount to be converted. After this, your orders will be processed by the exchange. What makes eCurrency Trade promising? Completion typically takes a few minutes after payments. The exact time, however, depends on the type of order placed. Normally, it takes about 20 minutes for users who sell bitcoins. On the other hand, buyers of the cryptocurrency can receive their crypto coins instantly if a Bitcoin client is operated. Web-based wallets require three to six confirmations that can take one to three hours to complete. For other currencies, a maximum of 24 hours should be allotted for completion. Keep in mind that there is a live chat function that operates for 12 hours a day throughout the year. Should you have any questions raised, its helpful team is just one click away. Online exchanges are truly a wonder in the modern world where converting cash takes no more than a few clicks. eCurrency Trade contributes to the foundation that makes digital currency a lucrative medium. Through its exemplary and straightforward services provided, obtaining bitcoins has never been easier. Furthermore, gamblers are guaranteed to lessen the trouble of acquiring bitcoins to be used for betting, and at the same time effortlessly convert their winnings from Bitcoin casinos.